Our goal here at the Motley Fool is: To help the world invest. Better. In that spirit, we're devoting a large portion of our time this September to letting the world know what it means to invest. Financial literacy isn't one of our country's strong suits, and we'd like to do what we can to change that. In that spirit, I'll be spending this week and next revealing three of The Motley Fool's most often recommended stocks among our premium services, and three stocks our analysts think you should be wary of. So far, I've highlighted two stocks our analysts are very bullish on, and two stocks they think you should be wary of. Today, I'm focusing on the last stock that our analysts think you should be especially cautious with. Back in 2008, Hidden Gems analysts Tom Gardner and Seth Jayson believed they had found a classically underpriced stock in the world of fashion. If you thought all Fossil (NAS: FOSL) sold were watches, you'd be mistaken. At the time, they owned several brand names in the fashion accessory market, like Relic, Zodiac, Adidas, Burberry, Diesel, and DKNY... to name a few. Tom and Seth were confident that the company's history of performing well under all economic conditions, as well as its ambitious plans to expand its retail footprint abroad, made the then-beaten-down stock a steal. It turns out they were right: Fossil's stock is up almost 200% since that recommendation. But that was four years ago, and this is now. What was a $28 stock now trades for about $85. At first blush, you'd think that high-end retailers would be big losers from the Great Recession. But the fact of the matter is, ours has been a bifurcated recovery, with the rich getting richer, and the poor continuing to miss out on the extra economic activity the recovery has engendered. 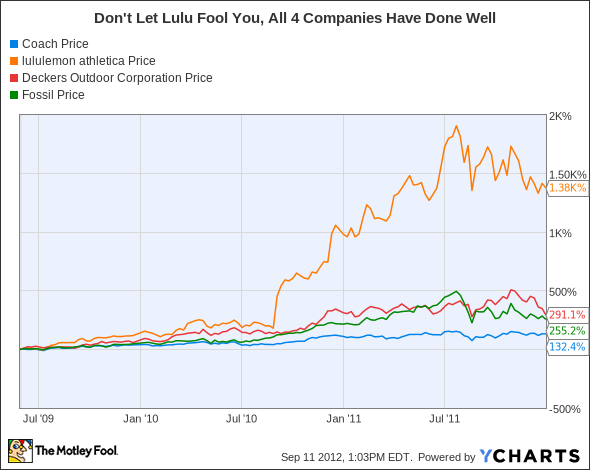 As you can see below, companies like lululemon athletica (NAS: LULU) , Deckers (NAS: DECK) , and Coach (NYS: COH) experienced tremendous growth between the time when the recession officially ended in 2009 and the end of 2011. Though it might look as if Deckers, Coach, and Fossil have experienced anemic growth compared to Lululemon, don't be fooled. During the same time frame, the S&P 500 (INDEX: ^GSPC) returned 36%; all four companies returned at least three times this amount. But not all high-end retailers are built the same. While some have continued to execute their plans, others, like Deckers and even Lululemon, have run into inventory and demand problems. Look and you'll see what a mixed bag it's been for these companies since the beginning of the year, with Lululemon emerging as the only clear winner. Starting in September of last year, Motley FoolAlpha's Matthew Richey began seeing troubling signs with Fossil. He recommended that his members short the company's stock due to bloated inventory, which was slowing growth both domestically and internationally, and compressing margins. It turned out to be a good call, as the stock suffered a huge loss in May as the company missed on revenue and lowered its guidance. Since then, the stock has recovered some of those losses, and Richey thinks it is once again ripe to take a spill. He cites slowed revenue growth and the same inventory problems as a reason to continue to short -- or at least avoid buying -- the stock. I'm not saying that everyone should go out and short Fossil. Shorting is a strategy that only seasoned investors who understand the inherent risks should attempt. For beginning investors, it's more than enough just to stay away from the stock while there are so many other options out there. If you'd like to take the first step toward becoming a better investor and understanding these different investing techniques, visit our special site: InvestBetterDay.com. On Sept. 25, we're taking a day to celebrate the art of investing, and you're invited to participate. Head on over to the site now to continue your own personal investing voyage. The article Keep Your Distance From This Stock originally appeared on Fool.com. Fool contributor Brian Stoffel owns shares of Deckers and lululemon athletica. 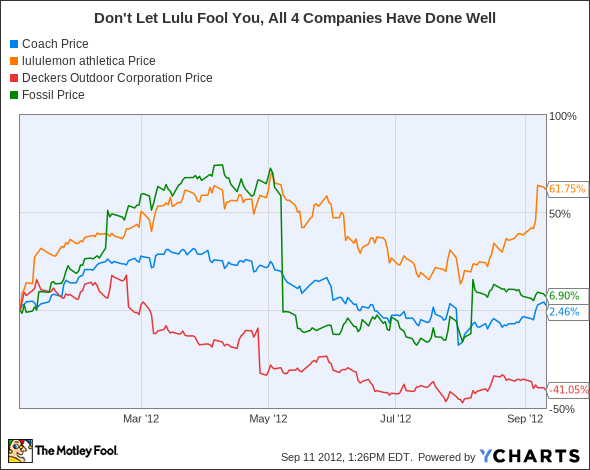 The Motley Fool owns shares of Coach, lululemon athletica, and Fossil.Motley Fool newsletter serviceshave recommended buying shares of Coach, Fossil, Deckers Outdoor, and lululemon athletic. A separateMotley Fool newsletter servicehas recommended shorting Fossil. The Motley Fool has adisclosure policy. We Fools may not all hold the same opinions, but we all believe thatconsidering a diverse range of insightsmakes us better investors. Try any of our Foolish newsletter servicesfree for 30 days.